It’s been 44 years since Mercedes-Benz stopped making a convertible version of its largest coupe. Yes, it’s been that long. Remember when the 220 convertible roamed the streets back in the 1950s? I also can’t let this space pass without mentioning the 220 SE cabriolet and the 280 SE cabriolet, could I? 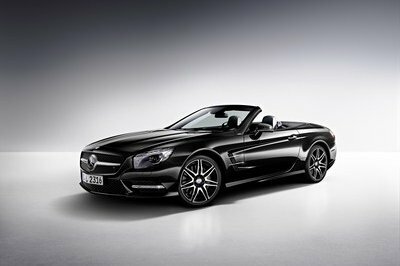 Yes, it’s been a while, but finally, Mercedes is bringing back its top-flight cabriolet to complete the S-Class lineup. 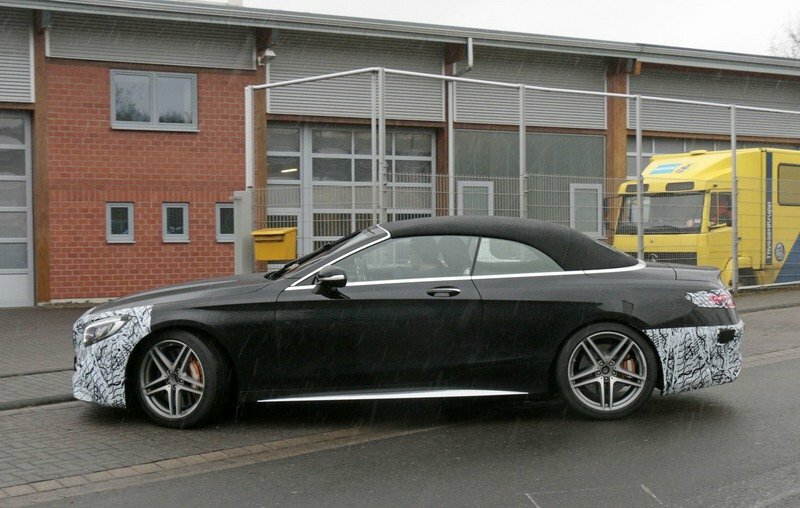 The arrival of the 2016 S63 4MATIC Cabriolet was months in the making after first being spotted doing some test runs back in February 2015. As expected, the returning cabriolet is bent on making up for lost time and laying waste to anybody foolish enough to stand in its way. That may or may not include the Bentley Continental GT. One of the many things Mercedes did right with the drop-top S-Class was sticking to the styling cues of its sedan and coupe brothers. It would behoove Merc to reinvent the S-Class’ wheel so it’s nice to see the company stick to what’s already working for its flagship model. 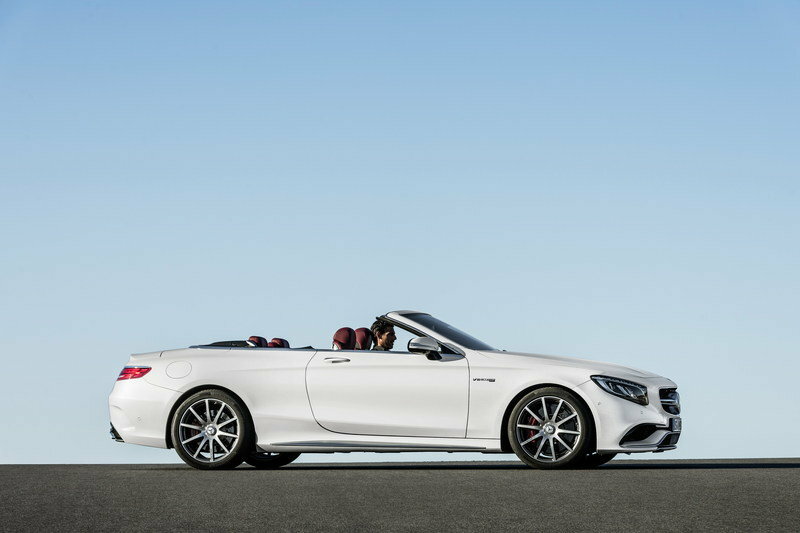 The S63 4MATIC Cabriolet does come with with its own set of unique characteristics, as is usually the case for a car with a three-layered canvas roof and enough proprietary technology to make Gottlieb Daimler and Karl Benz proud. So here it is, ladies and gentlemen. 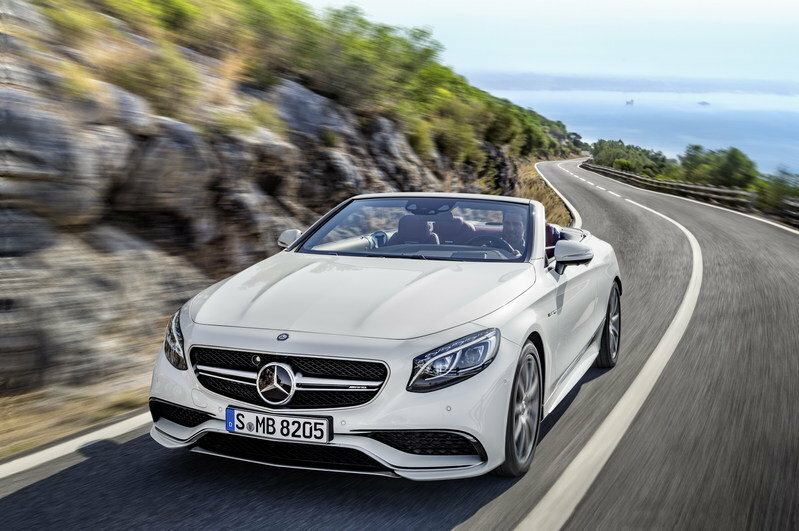 More than four decades since the last top-flight convertible featured a Silver Arrows badge, the 2016 Mercedes S63 4MATIC Cabriolet has arrived. Updated 09/25/2015: We’ve added a series of new photos we took at the 2015 Frankfurt Motor Show. Find them in the "Pictures" tab. 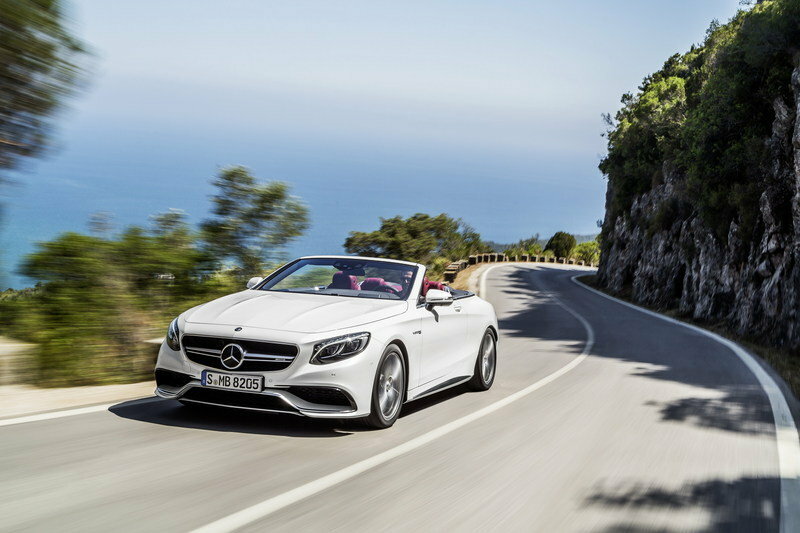 Continue reading to learn more about the Mercedes S63 4MATIC Cabriolet. As expected, the exterior of the Mercedes S63 4MATIC Cabriolet bears a striking resemblance to the 2015 Mercedes-Benz S63 AMG Coupe that Mercedes launched back in 2014. 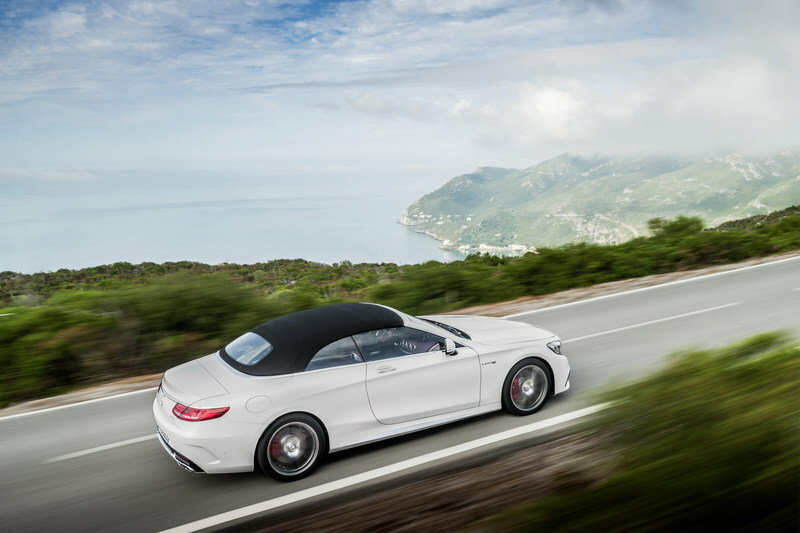 The character lines on the S63 4MATIC Cabriolet are more pronounced than that of the S63 AMG. 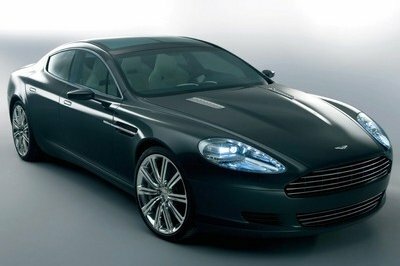 The LED headlamps, the diamond-pattern grille, and the aggressive bumper intakes are all there. 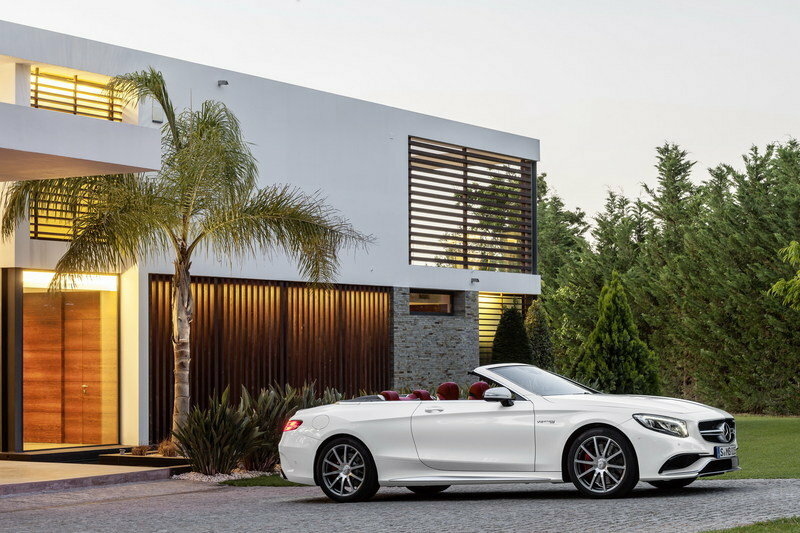 The character lines on the S63 4MATIC Cabriolet are more pronounced than that of the S63 AMG. That’s partly attributed to the obvious need of establishing some amount of aggressiveness on a convertible, something that coupes rarely, if ever, have to do. In somewhat of a little surprise is the presence of just two exhaust tips with their own sports flaps on the S63 4MATIC Cabriolet. Spy photos taken in the early part of 2015 showed quad exhaust tips on test mules of the car, but that might as well be the upcoming S65 AMG version, which Mercedes has yet to announce. In any event, the real distinguishing characteristic of the S63 is its three-layer canvas roof, which can be dropped or raised in less than 20 seconds and at speeds of 37 mph. That’s considerably better than the time it takes the Bentley Continental GT Speed Convertible - 25 seconds at speeds of 20 mph - to do the same. 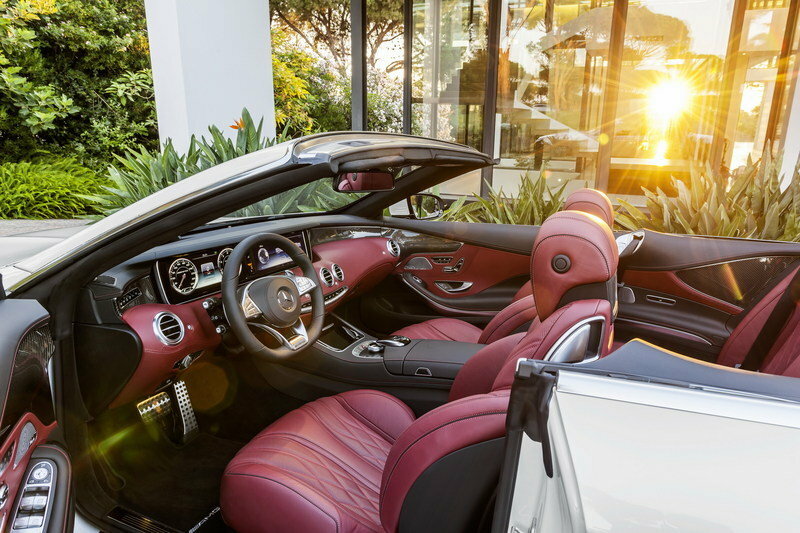 The S63 4MATIC Cabriolet’s interior was always going to be the trickiest part about the car, especially if it wanted to go up against the Continental’s all-world luxury cabin. Somehow, Mercedes delivered on that end without seemingly trying too hard to get there. The cabin itself is nearly identical to one found on the coupe, right down to the luxurious sporty seats wrapped in Nappa leather and the numerous wood and soft-touch surfaces on the dashboard and door panels. The cabin itself is nearly identical to one found on the coupe, right down to the luxurious sporty seats wrapped in Nappa leather and the numerous wood and soft-touch surfaces on the dashboard and door panels. The S63 also gets AMG’s own flat-bottom steering wheel with aluminum paddle shifters, the TFT instrument cluster with the 200-mph speedometer, and, well, enough AMG logos to remind everyone the engineering brains behind this car. 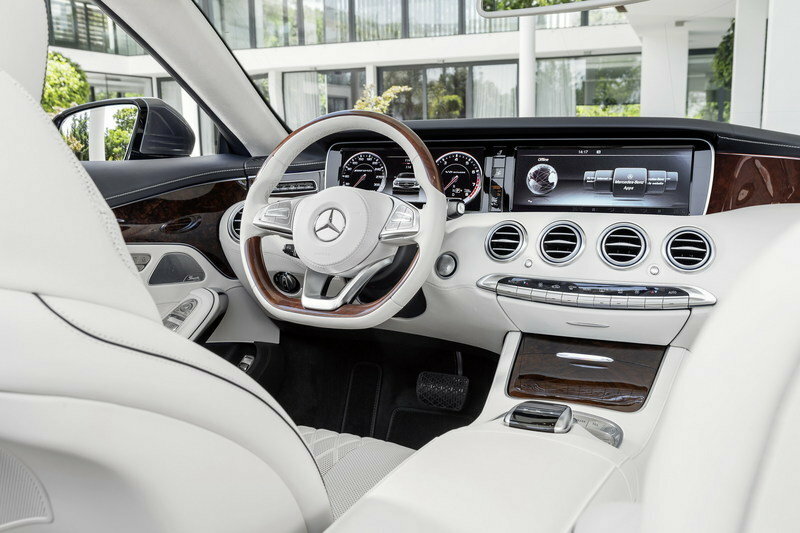 Speaking of fancy additions, the S63 4MATIC also received a handful of new tech features including the Airscarf neck heaters, Aircap wind deflection system, and a new climate control system called "Thermotronic." The Thermotronic system, in particular, is making its world debut on both the S-Class Cabriolet and the S63 4MATIC Cabriolet, which is to say that it’s a pretty important technology that will be used on future Mercedes models. I imagine the S63 4MATIC calling dibs on it, but the decision to include it into the cabriolet was probably a lot less exciting than that. In any case, the Thermotronic system functions like an intelligent climate control system, identifying on its own the ideal climate inside the cabin in all types of conditions. 12 sensors and 18 actuators bear the brunt of this work, determining the precise level of optimal air conditions for the driver and his passengers. 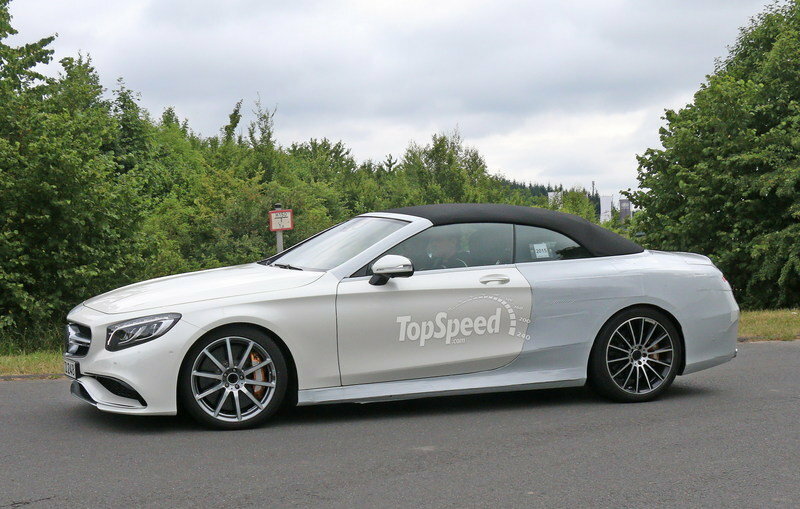 As you might have already guessed, the S63 4MATIC Cabriolet will use the coupe’s twin-turbo, 5.5-liter V-8. Output is identical at 577 horsepower and a whopping 664 pound-feet of twist, which will hit the pavement through AMG’s Speedshift MCT transmission with three modes (Controlled Efficiency, Manual and Sport) and stop/start feature as standard. The combo connects to a 4MATIC all-wheel-drive system that delivers 67 percent of the power to the rear wheels. Somewhat surprisingly, the S63 4MATIC Cabriolet can sprint from 0 to 60 mph in 3.9 seconds, exactly the same as its coupe counterpart. I would’ve thought that with the extra weight the cabrio has would add a little time on that split, but apparently, it’s just as quick to 60 mph as the coupe. Rejoice for the cabrio! Unfortunately, top speed is electronically limited to 186 mph, down a smidge from the coupe’s 189-mph top speed. Guess you can’t win them all, can you? 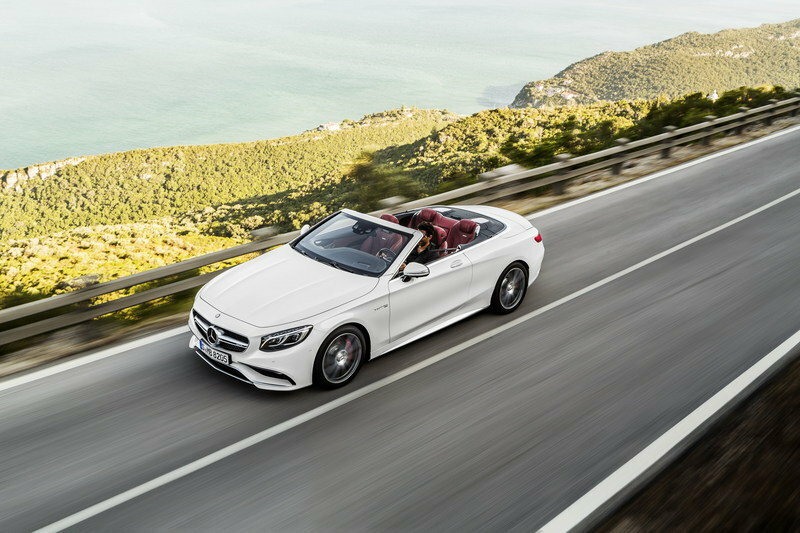 The laundry list of new technological features on the S63 4MATIC Cabriolet also includes the AIRMATIC air suspension and the ADS PLUS adaptive damping system. Together, these two programs allow the S63 to ride on varying levels of comfort and drivability. 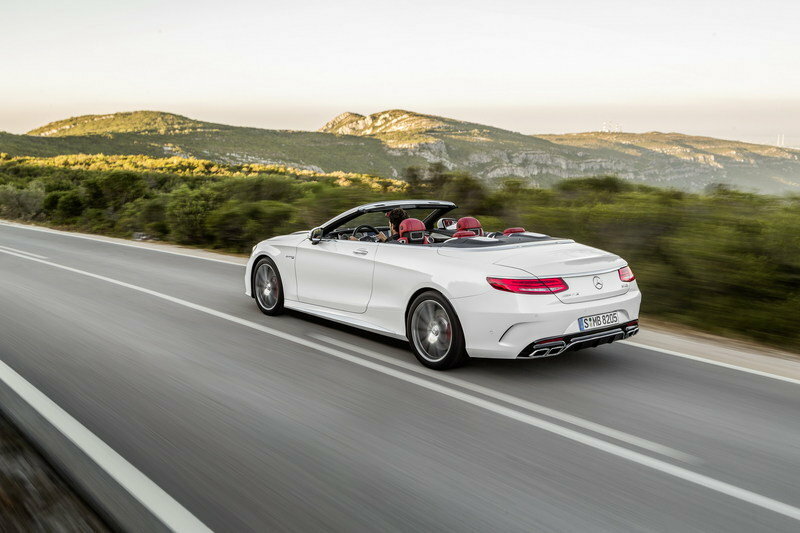 Mercedes fitted the S63 Cabriolet with a higher camber, a larger anti-roll bar, and a stiffer subframe carrier on the rear axle. These systems become more crucial in maximizing comfort inside the car when it’s driving at high speeds, ensuring that the driver and his passengers aren’t subjected to road bumpiness. 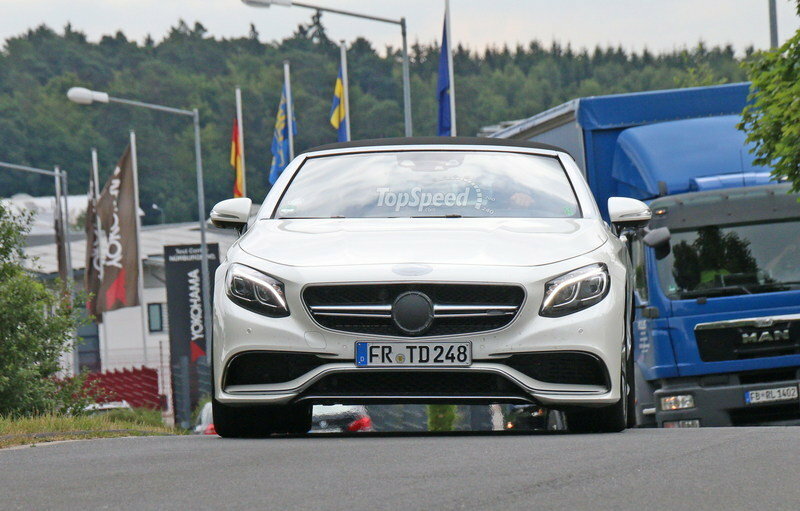 Mercedes also fitted the S63 Cabriolet with a higher camber, a larger anti-roll bar, and a stiffer subframe carrier on the rear axle to ensure maximum safety in the event the car gets into an accident. These are unheralded features that rarely make the headlines, as is the optional AMG high-performance ceramic composite brake system. But all together, they play a critical role in establishing a safe riding experience for the driver and his passengers. Pricing is still a mystery as of this writing, but what I do know for a fact is that the convertible will be more expensive than the coupe. With the coupe priced from $160,900, I expect the AMG S63 Convertible to fetch at least $175,000 before options. With the AMG S63 Convertible, Mercedes-Benz will enter a very small niche which currently features the Bentley Continental GT Speed as its most important player. Already in its second generation, the GT Speed is already three years old. 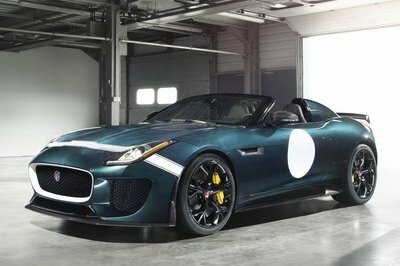 However, the British drop-top received a refresh for the 2016 model year, consisting of redesigned bumpers, a revised front grille, and a more pronounced spoiler integrated into the trunk lid. Having already gained a few horses in 2014, the 6.0-liter W-12 powerplant was carried over with 626 horsepower and 607 pound-feet of torque. A ZF eight-speed automatic does the shifting. Performance-wise, accelerating from 0 to 60 mph is a close contest, as the Bentley also needs four seconds to reach the benchmark. However, the Conti GT Speed wins the top speed battle at 202 mph. 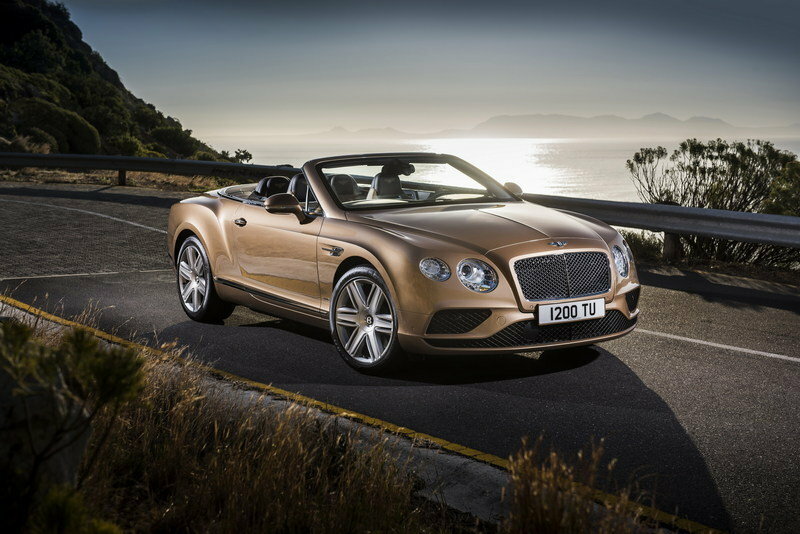 Pricing is where the British drop-top comes at a disadvantage, as Bentley asks about $240,000 for one before options. Find out more about the Bentley Continental GT Speed here. 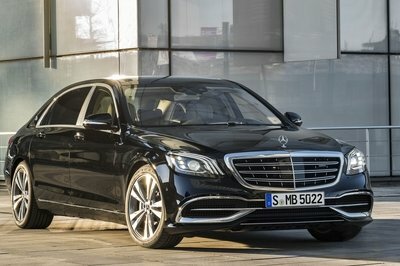 As soon as it announced plans to offer a coupe version of the S-Class, it became quite clear that Mercedes-Benz aimed to go where no other German manufacturer has dared so far. By adding AMG-prepped coupe and convertible versions for both the standard and performance models, Mercedes is turning the S-Class into a serious competitor for the Bentley Continental. Now that the S63 4MATIC Cabriolet has arrived, it might also be the time for the Bentley Continental GT Convertible to start looking over its shoulder. 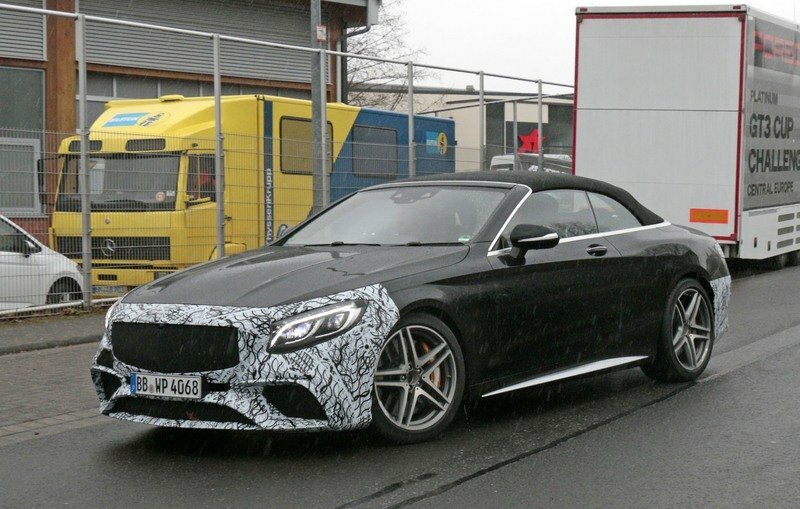 Updated 08/11/2015: The guys over walkoART Videos caught the upcoming S63 AMG Convertible in its final development stages. The car is expected to be unveiled next month at the 2015 Frankfurt Motor Show. 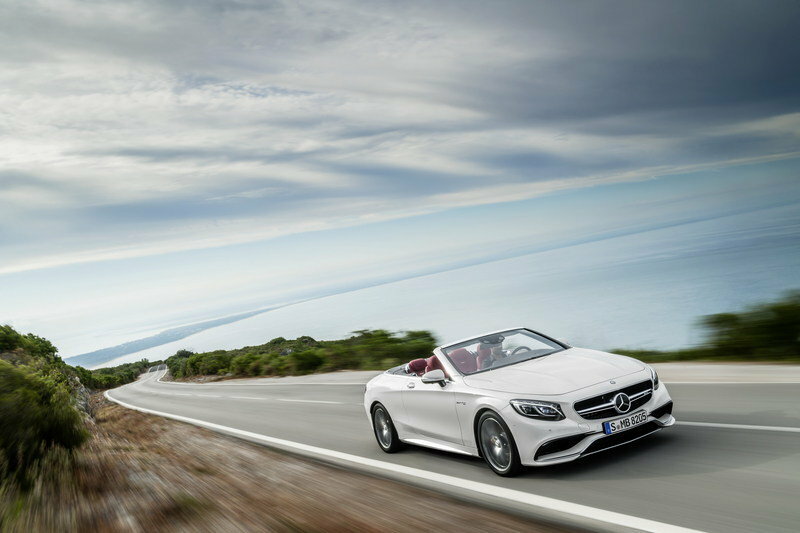 Mercedes-Benz is presenting a superlative dream car in the guise of the S63 4MATIC Cabriolet. 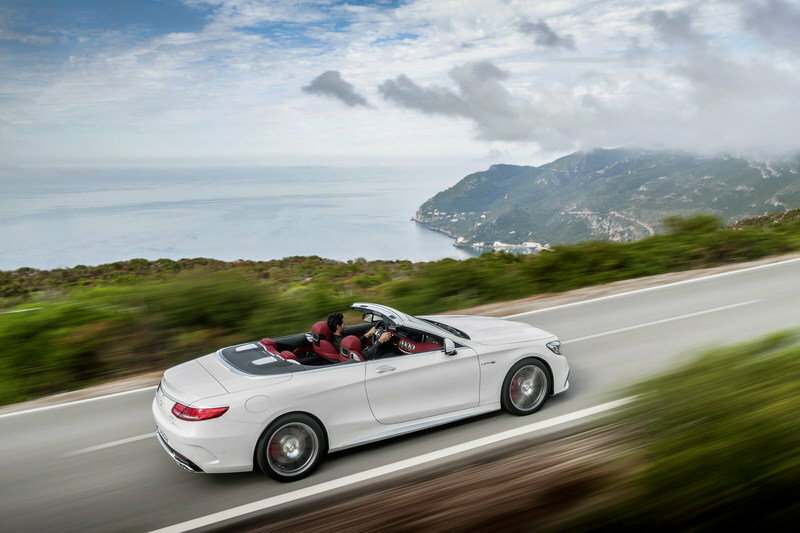 For the first time in its 48-year history, Mercedes‑Benz’s sports car and high-performance brand is offering a four-seater Cabriolet in the S-Class segment, adding to its product portfolio an attractive alternative for automobile enthusiasts with a desire for performance and luxury. The new model also offers its driver and up to three passengers space to travel in style. Its high-caliber statistics: 5.5-liter V8 biturbo engine with an output of 577 hp and peak torque of 664 lb-ft, AMG Performance 4MATIC all-wheel drive with rear-biased torque split as standard, acceleration from 0 to 60 mph in 3.9 seconds and a high-performance composite brake system for optimum deceleration. 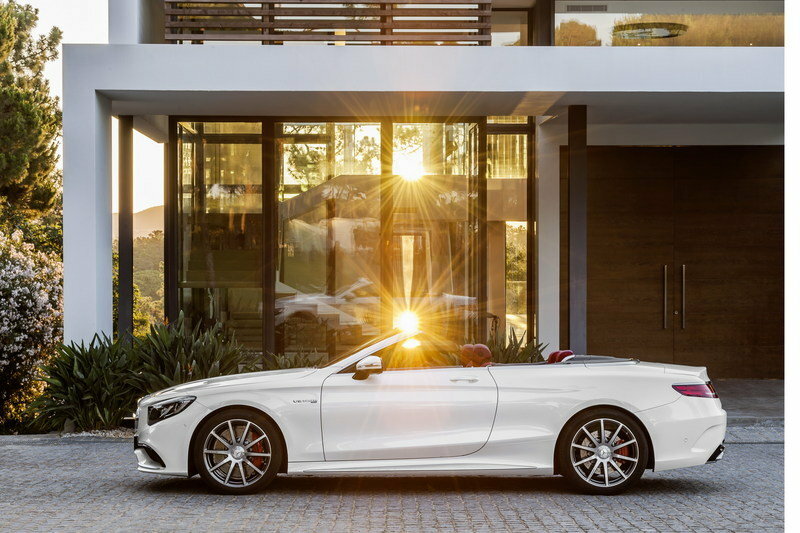 High-performance technology coupled with expressive exterior and interior design: It is immediately apparent that the new S63 4MATIC Cabriolet is built by car enthusiasts for car enthusiasts. "The new S63 Cabriolet is another fascinating AMG dream car from Affalterbach," says Tobias Moers, Chairman of the Board of Management of Mercedes-AMG GmbH. "The new model demonstrates in impressive style that we are keeping our foot firmly on the gas in 2015. We are continuing our model initiative with a vengeance - in all market segments." The increase in weight, which is inherent to the design of a convertible, has been limited through the use of a lightweight lithium-ion battery, AMG light-alloy wheels produced by means of a sophisticated forging process and the weight-optimized AMG high-performance composite brake system. 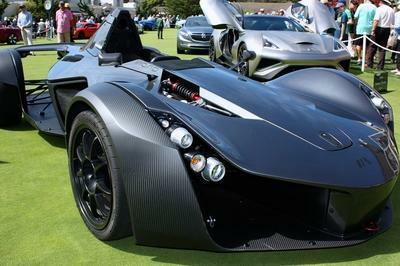 In addition, large parts of the shell and the front section are made of aluminium, as is the vehicle’s rear end. The S63 Cabriolet also adapts to the driver’s individual wishes in terms of its engine sound – from emotional and sporty to a more restrained alternative suitable for long journeys. The exhaust system has automatic logic-controlled exhaust flaps in both rear silencers. When the transmission is in "C" (Controlled Efficiency) mode, the flaps remain closed in most situations, in which case the eight-cylinder biturbo engine’s sound is more understated. In "S" (Sport) and "M" (Manual) modes, the exhaust flaps open earlier and more spontaneously, especially if the driver prefers a dynamic driving style. This results in an emotional, signature AMG engine sound. The biturbo eight-cylinder engine of the S63 Cabriolet is fitted by hand in the hand-finishing section of AMG’s production plant in Affalterbach. Highly qualified engine fitters assemble the engines according to the strictest quality standards based on the "one man, one engine" philosophy. Apart from serving as an AMG hallmark confirming superlative precision and production quality, the AMG engine plate bearing the engine technician’s signature also alludes to the peerless DNA of Mercedes-Benz’s sports car and high-performance brand. The AMG SPEEDSHIFT MCT 7-speed sports transmission combines perfectly with the V8 biturbo engine. Maximum agility and exciting dynamics are the two key strengths of this transmission, which is used exclusively at AMG. Drivers can configure their own personal set-up, depending on their driving style. There are three modes to choose from: "C" (Controlled Efficiency), "S" (Sport) and "M" (Manual). The standard ECO start/stop function is activated in transmission mode "C". The AMG specialists have also pulled out all the stops when it comes to the suspension: The S63 Cabriolet comes with the AIRMATIC full-support air suspension featuring the adaptive damping system ADS PLUS, which can be preset to "Sport" or "Comfort". At the touch of a button, the special configurations of these two programs enable outstanding agility and dynamics or unlimited comfort on long journeys and smooth cruising at low speeds. Specific front axle kinematics – including a higher camber, a larger anti-roll bar and a stiffer subframe carrier on the rear axle – have also been developed for the Cabriolet. The AMG-specific elastokinematics and parameterization of the continuously variable damper control, the lower air volume of the air suspension system and the progressive piston geometry nip unpleasant rolling and pitching in the bud. It is also possible to raise the vehicle’s level by 1.2 inches (30 millimetres) on poor surfaces. The chassis is lowered again automatically in "Sport" mode and from a speed of 75 mph in "Controlled Efficiency" mode. The S63 Cabriolet also boasts exciting looks to emphasize its sporty performance: The design is a stage for the exciting technology at the heart of the new dream car. Numerous exquisitely designed aerodynamic elements underscore the outstanding driving dynamics: the front end is dominated by the three-dimensional "twin-blade" radiator grille in silver chrome. Under the radiator grille is the "A-wing": this three-dimensional aerodynamic feature is painted in the body color and sports the stylized "A" that is a hallmark of AMG vehicles. Large, black flics surround the outer cooling air intakes. Down below, the front splitter in silver chrome optimizes the flow of air to the cooling modules. It also makes the vehicle appear closer to the road. The three-spoke sports steering wheel with its distinctively contoured rim and perforated leather in the grip area allows perfect vehicle control. Aluminium shift paddles shorten the reaction time when changing gear and enhance dynamism. Another feature displaying the hallmark AMG look is the high-resolution TFT color display as an instrument cluster with two animated round dials. In addition to the AMG-specific lettering and the needles in red/silver, further distinctive design features include the start-up display, the AMG logo in the speedometer with 200 mph scale and the "V8 BITURBO" lettering in the rev counter.